What does an average engine overhaul cost? Now you can see actual numbers from projects that have gone through OverhaulBids.com. “We already have a complete directory of all overhaul shops in the country and wanted to give people a price list too,” he continued. The price lists are a great way for anyone looking to buy an aircraft, or just for long term budgeting, he adds. For those who need their engine overhauled within the next six months, Overhaul Bids just launched a new feature to get quotes in an easy to understand apples and apples comparison. Upgrades are offered in two levels: Premium ($49.99) and Top Gun ($99.99). Both have the same display of quotes, but Top Gun allows the whole thing to be exported to Excel so the user can add local options to a spreadsheet and make modifications. Also with Top Gun, the user gets Depauw’s cell phone number for unlimited support. “We’re finding that 25% of our projects are upgrading and they are really happy with the support,” he said. On the day that Alan Depauw’s third child was born, a brief story about the launch of his new business, OverhaulBids.com, appeared on GeneralAviationNews.com. As he sat in the hospital room with his wife and new son, he remembers getting an email that a project had posted to the new website, which helps aircraft owners find shops to overhaul their engines. “Then another and another,” he recalls. “I checked my Analytics and it showed my website was loaded up with users all posting projects. By the time things settled, I had received 450 visitors from GeneralAviationNews.com and $1.2 million of overhaul projects in a day. This was the point that all my work over the last year came to life. The invention became real. “That was an emotional day for me — my son was born, and my business was born,” he added. 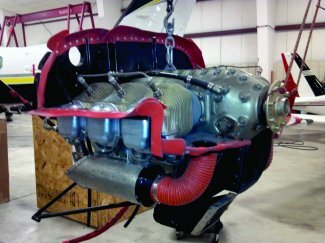 The idea for the business began when he was working as a CFI in Florida and a client asked for some help in getting quotes to overhaul the engine on his Baron. Telling the client he just didn’t feel comfortable making a recommendation, the idea for a new business began to form in his mind. So he came up with OverhaulBids.com, a website that addresses all those shortcomings. He likens it to an Angie’s List of engine shops — but with prices included — where owners can search for information on engine shops, pricing and reviews for engine overhauls and inspections. Now, an aircraft owner spends about two minutes posting a project and in less than a week, will have three to five quotes from the best shops in the country, along with information catered to their situation to help their decision. After the quotes are in, aircraft owners call the shops of interest and award their project to whomever they choose. Depauw has personally vetted every shop that bids for projects on his site — it took him four months to call all 75 shops on the site that do piston overhauls. There are some big names on the list too, including Western Skyways, Poplar Grove Airmotive, and Zephyr Aircraft Engines. It even has Continental Motors and Air Power submit quotes for factory engines. He also offers an educational component on the website to help aircraft owners really understand the process. The site’s learning center gives information on a variety of topics, such as understanding quotes, options, warranty, alternatives, and more. It’s loaded with external content for those who want more in-depth research on topics like what cylinders are most reliable. But even better for the aircraft owner, the service is free. The shops that win the bid pay a small finder’s fee to Depauw. Depauw acknowledges that a big fear of his when starting the business was that people would post the projects and then go with a shop without him knowing, allowing the shop to avoid paying a finder’s fee. That’s why, at first, he initially designed the website to process payments to the shops, less his fee, as a way of staying in control of the project. He notes that many of the people at the shops have helped tremendously in designing content for the website. He also feels a lot of responsibility for the aircraft owners using the site. And the owners seem to appreciate it as well. And that influence is growing. While he started with bids on piston aircraft, he’s already seen about $5 million in turbine projects go through the site, ranging from a single Pilatus owner to a fleet of Bell helicopters. He’s also seeing bids from charter companies and even some interest from the airlines. “It’s getting big quick,” he said, noting that the site’s current count of overhaul projects has soared to $12.5 million, up from $2 million in June. And that was surprising to him. For example, he didn’t expect to see turbine bids until maybe next year. “It seems like every week there’s something new,” he said excitedly. One new feature he recently added to the site lets people get learning center content emailed to them at a frequency of their choice. You can check it out by clicking the lightbulb in the middle below the picture at Overhaul Bids. Another new feature is under construction that will help standardize quotes, he noted. And GA pilots can remain confident that even as Overhaul Bids grows, they will remain a priority, according to Depauw. Depauw has a video that tells you how it works here. About one-third of all aircraft maintenance expenses are devoted to the engine, and when this vital organ needs to be overhauled, that figure could exceed the value of the airplane itself. Many owners find themselves bewildered by the process of completing an overhaul. It was for that reason that one man took on the task of researching every piston maintenance shop in the United States—doing all the dirty work in the name of “helping people make confident, well-informed decisions” about aircraft engine overhaul. Alan Depauw launched his new website, OverhaulBids.com, in March and since then, has already seen more than $10 million in projects. “Essentially, I solve the old world problem of calling around and rolling the dice,” said Depauw, a former Part 135 charter pilot and flight instructor. As stated on the website, OverhaulBids.com is essentially an Angie’s List specifically for engine repair. Depauw said Angie’s List founder Angie Hicks once said that she found success because the cost of deciding wrong is high, and that is especially true with engine overhauls. The price of a piston engine overhaul can be in the tens of thousands of dollars, with many different shops quoting wildly different prices from one another. If you choose incorrectly, expect to pay more in money, time, and aggravation. After deciding there had to be a better way, Depauw set out to research every piston maintenance shop in the country—an endeavor that took four months. Instead of contacting these shops as the entrepreneur of OverhaulBids.com, Depauw put himself in the shoes of a consumer and called as if he was looking to overhaul an engine for a personal airplane. After reaching out to 75 piston-engine overhaul shops in the United States, he narrowed his list down to 15 that now encompass his “A list” shops. All users of the site will need to create a free account in order to locate and get bids from engine overhaul shops. Users can also solicit bids for repairs and inspections, or simply search the list of shops. The website also helps educate users about engine overhaul. When a bid is accepted, the user contracts and communicates with the shop and pays the shop directly. Once the project is completed, aircraft owners are encouraged to write reviews, just as they would on a site like Angie’s List. 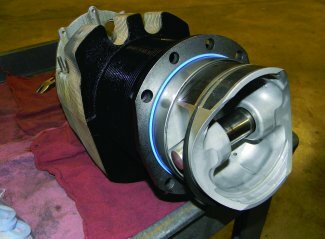 To date, OverhaulBids.com users have procured quotes for projects ranging from a prop strike to turbine engine overhauls for a fleet of military aircraft. Depauw has many more goals for his new venture, including expanding the network of maintenance shops to include all turbine engine overhaul providers in the United States and Canada (which he plans to complete by the end of August), but the one that trumps all is “helping people make confident, well-informed decisions,” he said. Depauw said he wants to stay true to personalizing customer experience and getting personally involved with his clients’ projects, which he acknowledged can greatly vary case by case. “I like to offer personal help to people and not be just some impersonal website that procures quotes. I believe in connecting people with the right shops for their needs,” Depauw said. Alan Depauw at Overhaul Bids reports that the start-up brought in more than $2 million of engine overhaul and repair projects in just its first three months. Overhaul Bids is similar in style to Angie’s List, but with pricing on engine repairs, overhauls and inspections. Overhaul Bids hand-picked 15 “Bidding Shops,” which include big names like Western Skyways, Poplar Grove Airmotive, and Zephyr Aircraft Engines. Continental Motors and Air Power also have submitted quotes for factory engines. Best of all? The service is completely free to the aircraft owner. Shops only pay a small percentage when they complete a project through the website. True to its mission of helping aircraft owners reach a well-informed decision, Overhaul Bids features more than 13 pages of learning content. It covers topics like understanding quotes, hidden costs, options, warranty fine-print, and includes links to external content like cylinder reliability surveys and expert opinions. 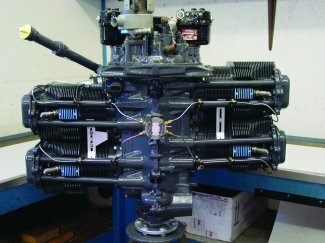 Overhaulbids.com is a free service that helps aircraft owners locate and get bids from engine overhaul shops and educates owners on the overhaul process. Engine overhauls give even the most experienced aircraft owners a case of the willies. Beyond the “it’s going to be really expensive,” there are numerous issues to face and decisions to make—choosing a shop; deciding on the type of overhaul, or a factory reman, and what to do about the engine accessories are some that come quickly to mind. On top of that, there’s the crapshoot aspect of the entire business—previously good shops can go through a bad patch or fall apart completely. Despite the fact that most overhauls go smoothly, there are plenty of horror stories out there. I’ve got my own—some years ago my airplane partner and I sent the engines out for what was to be a 30-day turnaround at a shop with a good reputation. We got them back six months later as a collection of parts from junk bins, and they were missing key components such as mags and ignition harnesses—yet the logbooks said they’d been run on a test stand for two hours. We got the FAA involved—and we learned that it has a criminal division. It came out that we weren’t the only ones who’d been had and, long story short, the shop owner spent a year in a federal slam. Nevertheless, we had to pay for another set of overhauls. That experience, combined with representing some owners who have had nightmare experiences with overhaul shops has caused me to be on the alert for services that will help owners when it comes time for an engine overhaul. Over the last few months I’ve had conversations with Alan Depauw, founder of an innovative new website and service, overhaulbids.com. Simply put, an owner goes to the website and puts in the information on the type of engine he or she needs to have overhauled, the site alerts a set of shops (and one engine manufacturer) it has vetted and considers to be responsive to customers. Within a few days, via the site, those shops provide detailed bids to overhaul that engine. In the interim, the owner will have had time to look over the educational materials on the website to learn much of what he or she will need to know to evaluate the bids. Currently, the website is set up for Continental and Lycoming piston engines but DePauw hopes to expand it to turbines. The website also includes a video of Alan DePauw explaining how the process works. In addition, during the time when the owner is collecting bids, Depauw sends emails to the owner providing information appropriate to the type of engine involved and directing the owner to further educational materials on the website. The goal, according to DePauw, is to help the owner become an educated consumer and make the overhaul process go as smoothly as possible. Upon receiving bids, the owner is encouraged to contact the shop directly to discuss the bids and make certain each party to the potential transaction fully understands what is involved—an engine overhaul isn’t cheap. Once a decision is made, the owner contracts directly with the shop and communicates directly with the shop as the overhaul progresses. 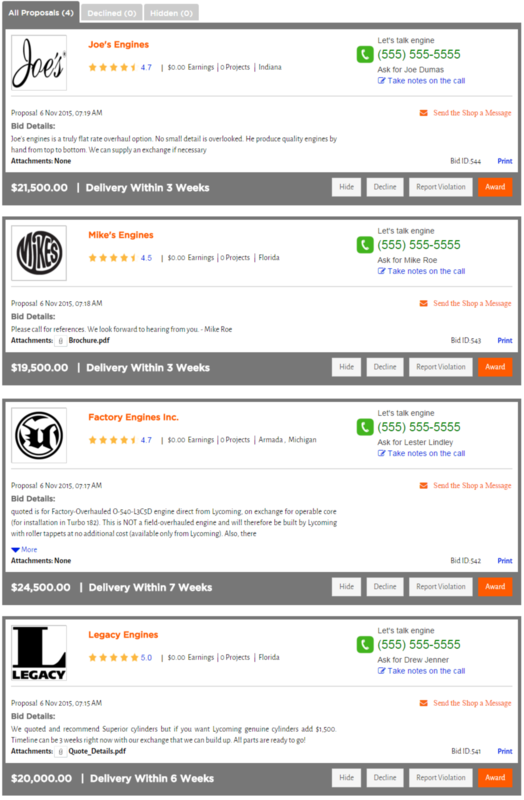 When the project is complete and the shop is paid, the shop pays what Depauw calls a referral fee to overhaulbids.com. I mentioned to Depauw that, shockingly, I’ve run across folks in aviation who were less than completely ethical in their dealings. 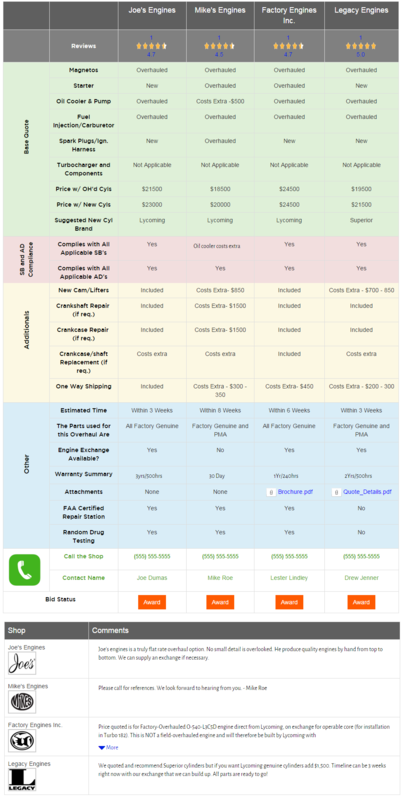 What would happen if the shop and the owner colluded to cut him out of his referral fee? His response was that part of his vetting of shops caused him to select shops that had a reputation for honest dealing and the shops desire the extra business they get through being sent requests for bids from the website—if they don’t uphold their end of the deal, that business stops. According to Depauw, who spent time as both Part 135 charter pilot and flight instructor and is now working in the finance world, there are about 75 piston engine overhaul shops in the U.S. (Continental deals directly with owners, Lycoming goes through distributors). He started creating overhaulbids.com after assisting a friend who needed to have the engines on his Baron overhauled. Depauw started trying to find out all he could about the various shops, including looking at owner comments on various aviation Internet forums. He eventually called all of the shops. Based on his experience with the way the shops responded to a potential customer, he created a list of shops that he felt had a good attitude and were responsive to customer questions and needs. He then approached those and asked them to make bids in response to requests from users of the website and pay a finder’s fee to the website for those bids that resulted in a completed project. As part of the continuing process of vetting shops, an owner is encouraged to write a review on the shop once the overhaul is completed. While Depauw doesn’t say how many bad reviews it would take to get a shop pulled from the website’s recommended list, he told us the vetting process will be ongoing. A significant part of the website is the learning center with some 13 pages of information and suggestions for owners—a lot of stuff I wish I had known years ago. It explains why a bid will probably have some price contingencies because the true condition of the engine can’t be known until it’s opened up. That’s especially important if parts are to be reused. It also explains that not all shops bid in the same fashion and gives information on interpreting bids and points out that direct conversation with the shop will allow the owner and shop to fine tune a bid. There is a link to the Blue Book’s estimated price of overhauling specific engines. The form the owner fills out to obtain bids includes a section where the owner can tell his or her story about the airplane and the engine—something that I think is important to help a shop get a little better feel for the engine when making a bid. Depauw told me that insurance companies are using the website to get bids when they are going to pay for prop strike/sudden stoppage inspections—seems to me like an efficient way to start the process. 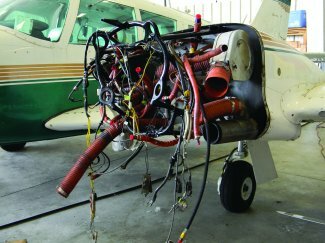 For several years now, Savvy Aircraft Maintenance Management has been managing engine overhauls for aircraft owners for a flat fee. It’s a service I value highly and, full disclosure, my aircraft partners and I used it the last time we had our engine overhauled. Yet, for the owner who wants to manage his or her own overhaul, I think the limited amount of information outside of Aviation Consumer magazine’s periodic engine overhaul shop survey makes it a time-consuming process. As someone who has had good and bad experiences with engine overhauls, my opinion is that Depauw’s website is a good step in the right direction for the aircraft owner faced with the need for an overhaul. It not only maps the location and identifies all of the shops that Depauw could identify as being in the business and states whether each one is a part of the overhaulbids.com program; it provides solid educational material on the engine overhaul process. I like that it doesn’t cost the aircraft owner a cent to use—and nobody pays anything unless an overhaul actually takes place. Let’s admit it. Making decisions on an engine overhaul is difficult. It’s not like buying a car where you have nearly perfect data and can make an informed decision. Instead, you’re forced to spend the same kind of money with little to no information except what the salesman told you. Not to mention the stakes are much higher with an overhaul. Finally, a website emerges to help aircraft owners make informed decisions. The website is OverhaulBids.com. It’s the fastest way for aircraft owners to find shops, pricing, and reviews for engine overhauls and inspections. Oh, and it’s completely free. Here’s how it works. Aircraft owners spend two minutes to post their engine project. Once posted, an email goes out to every shop in the Overhaul Bids network. Shops sign in and post competitive bids on the project. The owner then calls shops of interest, and decides who to use. Overhaul Bids is the only place where you can find all of the engine overhaul shops in the country. It’s searchable by keyword, capability, and location. You can even map your results to gauge proximity. It also has a learning center to help you learn about piston engine overhaul so you can get unbiased information about topics like understanding quotes, options, warranty, alternatives, and more. It’s loaded with external content for those who want more in-depth research on topics like what cylinders are most reliable. Lastly, you’ll get personalized support for your project from start to finish by the founder of the website, Alan Depauw. Overhaul Bids isn’t just for aircraft owners. It’s also there to help shops expand their reach in a risk-free way. Shops only pay a small fee when they complete a job won through the website. Overhaul bids supports projects for all engine manufacturers and specializes in piston engines. Examples are Engine overhaul, Prop strikes, Hot section inspections, and anything else that you would use an engine shop for. About Overhaul Bids: The idea for the website came to founder, Alan Depauw, when he noticed the shortcomings of getting overhaul quotes and verifying reputation by the traditional way of searching and calling shops. He can’t think of another example of risking $15,000 or more on a service from a virtually unrated supplier. Now aircraft owners can have a third party source of reviews don’t have to waste hours searching and talking on the phone to get quotes. It’s like the Angie’s List of engine shops but with pricing too. A new website, OverhaulBids.com, has launched to help aircraft owners save time — and money — when it’s time for an overhaul. Likened to an Angie’s List of engine shops — but with prices included — owners can search the site for information on engine shops, pricing and reviews for engine overhauls and inspections. And it’s free to use. The idea for the website came to founder, Alan Depauw, when he noticed the shortcomings of getting overhaul quotes and verifying a shop’s reputation by the traditional way of searching and calling shops. Here’s how it works: Aircraft owners spend two minutes to post their engine project. Once posted, an email goes out to every shop in the Overhaul Bids network. Shops sign in and post competitive bids on the project. The owner then calls shops of interest, and decides who to use. Overhaul Bids is searchable by keyword, capability, and location. You can even map your results to gauge proximity. It also has a learning center to help you learn about piston engine overhaul so you can get unbiased information about topics like understanding quotes, options, warranty, alternatives, and more. It’s loaded with external content for those who want more in-depth research on topics like what cylinders are most reliable. Overhaul Bids isn’t just for aircraft owners, Depauw noted. It’s also there to help shops expand their reach in a risk-free way. Shops pay a small fee when they complete a job won through the website. Overhaul bids supports projects for all engine manufacturers and specializes in piston engines. Examples are engine overhaul, prop strikes, hot section inspections, and anything else that you would use an engine shop for. Overhaul Bids is the only place where you can find all of the engine overhaul shops in the country. It’s searchable by keyword, capability, and location. You can even map your results to gauge proximity. It also has a learning center to help you learn about piston engine overhaul so you can get unbiased information about topics like understanding quotes, options, warranty, alternatives, and more. It’s loaded with external content for those who want more in-depth research on topics like what cylinders are most reliable. Lastly, you’ll get personalized support for your project from start to finish by the founder of the website, Alan Depauw. Overhaul Bids isn’t just for aircraft owners. It’s also there to help shops expand their reach in a risk-free way. Shops only pay a small fee when they complete a job won through the website.